Because the Sourgrass run is at higher elevation (4000′) the landscape is quite different from other California foothill runs. Transparent turquoise water tumbles over granite boulders and meanders through giant redwoods creating an incredible array of contrasting colors. Although most people would argue that the scenery alone is worth a trip to the North Stan, the whitewater is also quite thrilling. Put-in just below a chunky Class V+ rapid that may look runnable, but is not advisable. The run starts off just below with some of the hardest rapids, Beginner’s Luck and Rattlesnake. 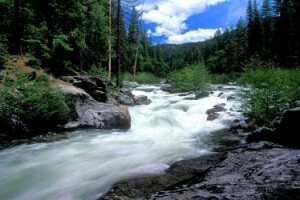 Depending on the flow, these rapids are quite challenging and are always worth a quick scout. The rapids continue to excite boaters all the way through the end of the run with rapids such as Bearclaw and the infamous Maycheck’s Mayhem, and the North Stan finishes with a grand finale at mile 7 with the Sequoia Sluices, three consecutive Class IV tiered rapids. Non-boaters can hike down to the bridge over the river at this point to watch their kayaker or rafter friends try their luck in these last three rapids. This is also a great spot to take photos. You can take your boats out here by hiking up to the bridge, or continue on down to McKay’s Point for a few more miles of Class V and some beautiful whitewater. The McKay’s section is for experts only. Most commercial rafting outfitters take out at the bridge. The North Stan used to be a classic run in California, but the flood of 1997 wiped out a few Class IV rapids and left in its wake an unrunnable Class V+ rapid just upstream of the current Sourgrass put-in. The main fork of the Stanislaus River, once the most popular rafting and kayaking run in California, gained notoriety in the late 1970’s and early ’80’s when the extremely controversial New Melones Dam was constructed and buried the Stanislaus River under New Melones Reservoir. Since then, California’s rafting epicenter shifted to the American River and even the runnable parts of the Stanislaus are boated infrequently. The Sourgrass Section deserves more attention for it’s continuous, difficult whitewater and the beautiful Sierra canyon it flows through. Located just east of the charming mountain town, Murphy’s, numerous foothill wineries, and just west of the beautiful Bear Valley Ski Resort, the North Stanislaus is perfectly situated for you to enjoy a fun and adventurous mountain vacation.